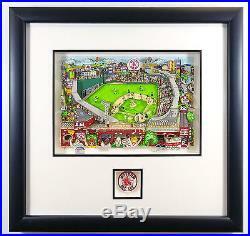 Offered is a wonderful limited edition 3D serigraph Red Sox Fever by Charles Fazzino. This beautifully framed Artist Proof Deluxe (APDX) Edition goes through a hand-printed silkscreen process with each pop-up meticulously hand cut, glued, and assembled. Only 50 pieces in the APDX Edition were created with three layers of dimension (base layer and two additional layers of pop-ups) on white museum board with genuine Swarovski Crystals scattered throughout the artwork! Each piece is an individual creation and is also hand signed, titled and numbered by Charles Fazzino. Comes to you in a shadowbox frame as shown, utilizing museum quality materials consisting of 1.5 wide matte finish black wood molding, double-matted (white outer mat and black inner mat) and covered in plexiglass. Framed size is 22.75 wide x 21.25 high with an upper image size of 14 wide x 9 high. Artwork includes the original Fazzino Studio (Museum Editions LTD) Certificate of Authenticity. Having assisted both seasoned and novice art collectors since 1993, Barker Animation has remained one of the most trusted and preferred sources for animation and pop culture artwork in the world. Edition numbers vary, and may differ from what is pictured. Any apparent imperfections are a result of photography only. The item "Charles Fazzino Boston Red Sox Fever APDX Edition 3D Pop Art Framed Sold Out" is in sale since Friday, April 24, 2015.